Jedong Temple site is in Wotanmas Jedong village, Ngoro district, Mojokerto regency, in the north of mount Penanggungan slope. From various literature known that 12 ancient inscription have been found in Jedong site, seen of their epigraphy code / name of those ancient inscription with Jedong ancient inscription I – XII. The discovery of Tulangan ancient inscription (Jedong I) made from bronze, old letter Javanese in Jedong area (Brandes 1913, Naersen 1938), Jedong ancient inscription had already been insist since 832 Saka (910 C), because at that time had been become Perdikan (Sima) Tulangan village. So, Tulangan is become the first term of Jedong. In this time resembled with King Balitung government (898 – 913 C) with govern ancient inscription II (Kambang Sri) made from stone, Javanese old letter 484 Saka (929 C) it’s say about King Rakai Layang Dyah Tulodong who govern ancient Mataram Kingdom in Central Java 920 – 928 C year, that give a clue of Jedong name which changed become Kembang Sri. Jedong ancient inscription III (Kambang Sri II) made from stone, Javanese old letter with number of 850 Saka year (928 C) government 929 – 948 C in ancient Mataram Kingdom East Java. King Tulodong govern ancient Mataram in Central Java and King Sendok governs ancient Mataram in East Java, Jedong site was still known as Kambang Sri. Another file said that from ancient Mataram period Jedong Temple site was become Perdikan village with name Tulangan, then in the next period, changed become Kambang Sri. The three of ancient inscription above is long ancient inscription, while the other from Jedong IIIa – XII is short ancient inscription, which only consist of 3 – 4 letter usually called year number ancient inscription. Jedong ancient inscription IIIa made from stone, Javanese old letter with number of the year 962 Saka (1040 C) resembled with King Erlangga governed in 1021 – 1042 C.
Jedong ancient inscription IV made from stone, Javanese old letter in 1041 Saka year (1119 C) (Knebel 1907). Right now, thus ancient inscription is in Rescuing Bureau statue (museum) Trowulan – Mojokerto with inventory number 547. In this time resembled with King Bameswara government in Panjalu. Jedong ancient inscription V and Va made from stone, Javanese old letter in 1161 Saka year (1239 C) (Verbeek 1888), it meant resembled with period of Anusapati government from Singosari Kingdom that come in this area (Hasan Djafar 1978). Jedong V in year of 1169 Saka (1247 C) is also resembled with King Anusapati government from Singosari Kingdom. Jedong ancient inscription VI made from stone, Javanese ol letter in 1198 Saka year (1276 C) (Verbeek 1891) resembled with period of King Kertanegara government (1268 – 1291 C) from Singosari Kingdom (Hasan Djafar 1978). Jedong ancient inscription VII and VIII made from stone, Javanese old letter with number of the year 1037 Saka (1315 C) (Knebel 1907) which resembled with King Kertanegara government period from Majapahit Kingdom. Siti Jedong ancient inscription made from white stone, Javanese old letter number of 1270 Saka year / 1348 C (OV. 1927) its an inscription that is ingraved in base of statue (pedestal). This ancient inscription has been keeping in the East Java Bureau of relic Olden times preservation in Trowulan, Mojokerto. This ancient inscription resembled with Bhre Kahuripan government / Tribuana Tungga Dewi in 1328 – 1350 C (Hasan Djafar 1978). Jedong ancient inscription IX and X made from stone, Javanese old letter both of them substance year number 1298 Saka year (1376 C) (Krom 1911) and in 1307 Saka year (1385 C) (TBG.XLVII 1954) it mean that resembled with King Hayam Wuruk government from Mojopahit Kingdom that governed in 1350 – 1389 C (Hasan Djafar 1978). This ancient inscription found near Jedong gate, which in the golden period was a part of Perdikan area of Mojopahit Kingdom. In the entrance gate I found inscription: Brahmana – Nora – Kaya – Bhumi: 1307 Saka (1385 C) (Brandes 1808). Jedong ancient inscription XI and XII made from of stone, both of them are come from Jedong site substance year number 1350 Saka (1428) (Krom 1915) and in 1378 Saka year (1456 C) (Verbeek 1891) which resembled with Bhre Hyang Purwawisesa government period (Girisa Wardhana 1456 – 1466 C) (Hasan Djafar 1978). Based on that ancient inscription it can interpretation Perdikan Jedong region had already existed since ancient Mataram period last Mojopahit period. In the Strophe LXXXVIXI Nagarakartagama book mentioned. “Kwi ni darmalpas/pratista Ciwa Mukya Kuti Balay I Kanci len Kapulungan, Roma, Wwatan Iswara Ghraha……… . (Pegeaud, 1960). “Perdikan Siwa village that free from tax, Kanchi niche monastery, Kapulungan, Roma, Wwatan Iswara ghraha…….. (Slamet Mulyana 1977). If it connected to the mentioning the name of ancient village such as Kapulungan and Wwatan, so Kapulungan is name of a village in Gempol – Pasuruan, it’s almost same with Kapulungan that mention in Kudadu ancient inscription in Wotanmas village which the place of Jedong gate stand. The shaped of Jedong temple is gates and has shape of Paduraksa, made from andesite stone and brick. According to the report in 1907 that there was three gates in Jedong village, but right now two pieces left that still intact. Brick gate that located in north chisel in year 1326 C and right only ruins left. While two gates made from andesite stone which each gates 80 meters from the center (the door side) west – east that still can be saw. Both gates surrounded by expensed wall, which placed in west side of terrace. The shape of gateway I is Paduraksa means that a gateway which each roof becomes one, with length 12,51 meters, 5,19 meters width and 9,75 meters height made from andesite stone. Jedong gate I have 3 parts, they are leg, body and roof, indoors and outdoors is in a part of the body looks out on west and east. In the part of legs and bodies area undecorated or plain. While the roof pasrt decorated of Kala is stick on the each side and then in the upper phase decoration of small gate is stick in a row. 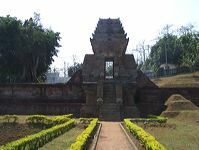 In every corner decorated with mount design (antefik), in a doorstep of Gate I is found year number with Chandra Sangkala shape it sound like this Brahmana – Nora – Kaya – Bhumi in year 1307 saka or 1385 C. The function of this gate was as an entrance / gate directed to the Perdikan / Sima village and sengkala of the doorstep as possibility as gate official announcement year as an entrance to the perdikan village. The shape of Gateway II is also Paduraksa, means that gates with each roof becomes one, with length 6.86 meters, 3,40 meters width and 7,19 meter height, made from andesite stone. There is no chisel year number in gate II, but in second door found ex material stone with chisel year number I 1378 Saka / 1456 C. Because the art decoration and construction style. Based on the year that had been found with ages in year 1326 C, Jedong gate have already calculated in that year. From another explanation mentioned year of 1456 C, it’s mean that Jedong was still in used until that time. 1. 1945 constitution, article 32 mention that government support National Indonesia cultural. 2. Number 5 ordinance in 1992 about culture preserve things. 3. TAP MPR RI No. II/MPR/1993 about broad outlines of the Nation Direction, which develop to motive culture resource for widespread importance. Based on those ordinances, so in 1992 the implementation of archeology feasibility study for Jedong temple had been done with conclusion that Jedong temple must restore in totally restoration. The implementation of Jedong temple I and II restoration begin in 1993 / 1994 fiscal years until 2004 in 11 phase done by East Java Relic History Founding and Archeology project. When excavation is in implementation in the right and left of the gate construction found brick structures, which is fence connection, to prove it the excavation do to that place. The main purpose is to show up the building construction and find a few artifacts, which is very important archeological data to reveal: mean, shape and function. The result of the excavation invention in Jedong temple are phallus, statue, dwarapala, jaladara that made from andesite stone and a bronze bell. The result of the excavation, which is done gives certainty that between both construction have fence structure / talut that made of brick.